When Content Marketing Institute founder Joe Pulizzi announced he would be taking an “internet-free sabbatical,” I must admit, I was surprised. As community manager, I would keep an eye on Joe’s social media accounts. I knew he received dozens – if not hundreds – of messages each day. How can anyone ignore their tweets and tagged photos? Seemed impossible. Plus, my marketing friends and I are on social media for a good part of our day. The thought of walking away is a foreign concept to me. But Joe did it. He had planned to disconnect for 30 days, but he unplugged for much longer than that. 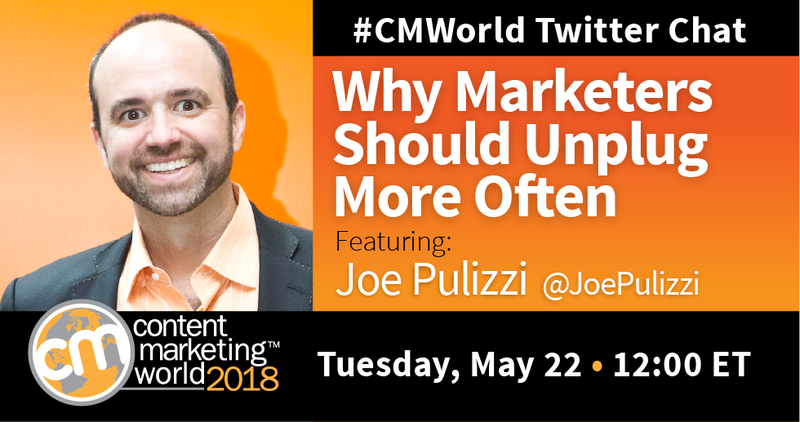 So I was giddy when Joe agreed to log back on to join the #CMWorld Twitter chat this week. I don’t need to tell you that technology plays a significant role in our industry. But how important is it to “power off”? We had a lively discussion, excerpts of which you can find here. Take a look and weigh in by leaving a comment below. Want to see more tweets from this chat? Check out our Twitter Moment. In our technology-driven industry, is it possible to limit screen time during work? Outside of it? Many of us can’t go about our day without looking for new content ideas at every turn. Will unplugging hurt this or help this? Some people may think “unplugging” is just a buzzword, but hopefully pulling yourself away from your phone or laptop aren’t passing fads. Joe has proven disconnecting can have great benefits. What about you? Do you think you could do it? Meet Joe and take a selfie with him at Content Marketing World. I’m sure he won’t mind if you tag him. Register by May 31 to snag Early Bird discounts. And use code SM100 for an additional $100 off!